I was flicking through yesterday’s Times when I saw the most amazing thing. Looks like a frog right? Look a little closer…can you see the five people? 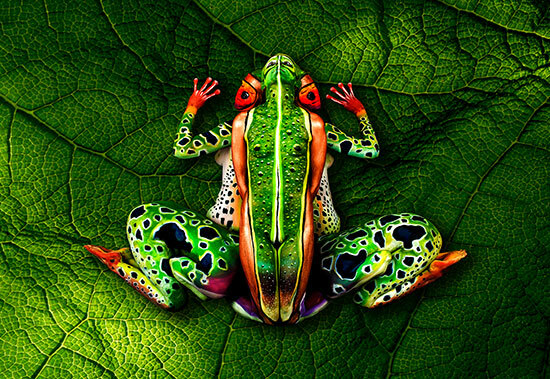 This colourful tribute to the amphibious is courtesy of 2012 Bodypainting World Champion Johannes Stötter. While there’s part of me that wonders at the ways people keep themselves busy (eg. how do you first work out you want to paint bodies), the other part of me finds this fascinating. And I guess that’s the power of art – polarising, puzzling, poignant. Sometimes none of these. Sometimes all three…and then some. Anyway Stötter has been using the body beautiful as his canvas for 12 years, having painted his first at the age of 23. His website and facebook page are a veritable showcase of the human frame drenched in the inspirational colour and texture provided by the world around us. It certainly brightened up the News section of The Times. ps…and speaking of brightening things up, the Wish List is underway and there are only 24 sleeps to go until the Big Birthday Bonanza…can you feel the excitement? This entry was posted in Expat moments, Inspired by and tagged bodypainting, Johannes Stoetter, sleeps to go, The Times by Kym Hamer. Bookmark the permalink.